CREW Boston is pleased to announce the launch of the Development Project Management Group, aimed at bringing together CREW members who focus on physical project creation and implementation over the length of a development project—such as members of the OAC (owner, architect/engineer, contractor) team. The group aims to serve as a networking and referral group for contributing professionals, to share experiences, observations and concerns and to promote better understanding of the perspectives, priorities and working styles of the various team members, encouraging exploration outside of one’s own professional focus. 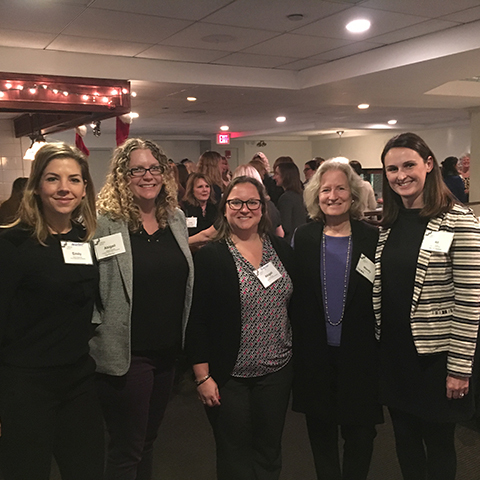 The Development Project Management Group of CREW Boston hosted their first program of the year with a presentation on SHE VILLAGE in the Seaport. Ali Ribiero, Development Project Manager at WS Development, described how the 9 pre-fab modules were selected, installed and leased out to create SHE VILLAGE – a temporary shopping experience featuring women-owned businesses which are open through December. It is WS’ first venture into modular, pop-up retail. WS is planning to offer a different experience over the winter, and to have new retail shops installed for spring. The CREW Development Project Management Group hosted a successful kickoff event on December 4. Nearly 40 women attended the event and enjoyed drinks, snacks and networking. The group co-chairs gave a brief overview of the genesis of the group, its goals, and what members can expect for future programming. Members participated in a icebreaker to introduce themselves and something they are working on in their personal or professional life. Feedback about the group was extremely positive and the members in attendance indicated a strong desire for a group to fill this niche within the CREW offering. Many members provided suggestions for future programming. The next event is expected to be scheduled in early 2018.